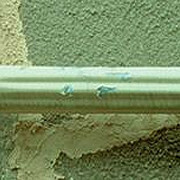 Paint has lost its adhesion to a galvanized metal surface. Remove all loose, peeling paint down to the bare metal. Clean the exposed metal of any contaminants, such as dirt, oil, etc., and treat them with an etching liquid. Be sure to wear long sleeves and gloves to protect your arms and hands. Rinse the surface with clean water. Allow to dry. Apply a galvanized metal primer. Repaint with a high-quality paint.